No weapon created for your harm will succeed against you. and you will condemn every tongue that rises against you in judgment. It is a reality that we have an enemy that is prowling around like a lion who would like to harm us. We do not have to be fearful or paranoid about this, but it is helpful to be aware of his opposition. 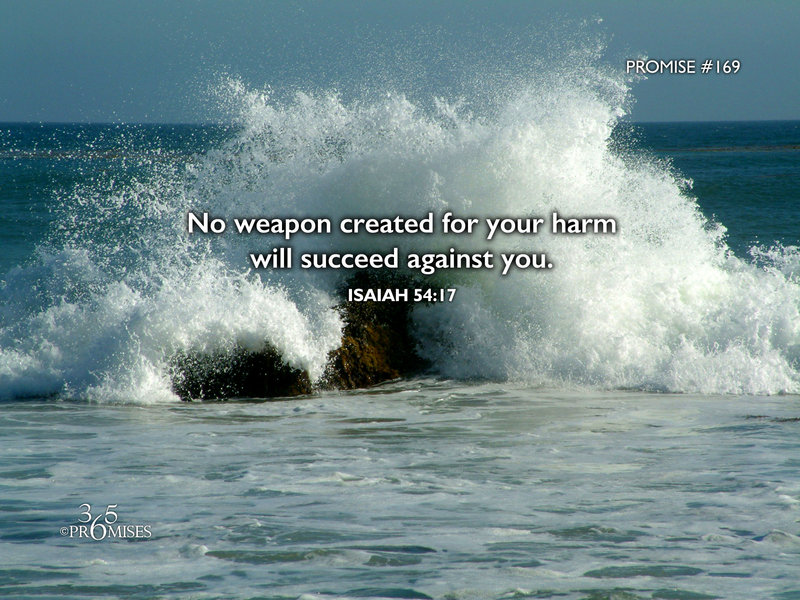 In this promise found in Isaiah, God makes the promise that no weapon that is formed against us by any enemy will prosper. He goes on to say that every tongue that judges us will be condemned. It is encouraging to be reminded that God is on our side and He is fighting for us. No matter what or who opposes us, our Father promises to be with us through every storm and protect us by His great power. This is the heritage of the Lord. This is our birthright! ...To live under the protection of the Most High (Psalm 91). I realize that this does not mean that we are completely insulated from trials in life. Jesus said in John 16:33 that as long as we are in this world, we will experience trouble. Praise God though that Jesus has overcome the world! When I think of any opposing forces that are against me, whether they are earthly or demonic, I take great comfort in this promise from my Father... No weapon that has been created for my harm will succeed against me! That is my inheritance and it is your inheritance too!